The kennels are situated in the back of our house. 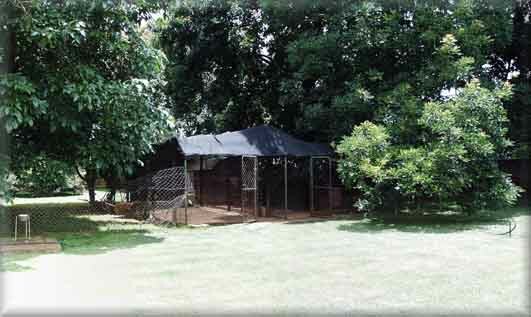 There are two kennels made up with diamond mesh and each has a wooden “wendy house” at the back. When we have a litter of pups, they are whelped in the spare room in a big whelping box. They stay there till they are about 4 weeks old. At that point they are moved to the outside kennel within an extra smaller enclosure to prevent them from going to the diamond mesh and sticking their heads out and getting trapped. To overcome this problem I have had “gates” made out of weld mesh, which hook into each other to form this inner enclosure for the little ones. At night they come back into the house and stay in a similar “playpen”. My dogs are seldom in the kennels. They are usually with me, lying near me where ever I work in the house. They also have the run of a large garden. Below are some panoramic views of our garden. You can view a larger version of the (flat) panorama by clicking on the pictures below, or for a more realistic experience you can view the the garden using QuickTime virtual reality by clicking on the links below the pictures.